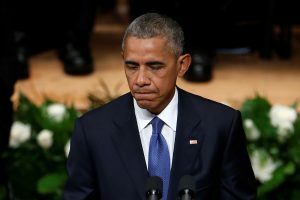 DALLAS — At a memorial for slain police officers, President Barack Obama declared Tuesday that a week of deeply troubling violence has appeared to expose “the deepest fault lines of our democracy.” But he insisted the nation is not as divided as it seems and called on Americans to search for common ground in support of racial equity and justice. Obama acknowledged Americans are unsettled by another mass shooting on their streets and are seeking answers to the violence that has sparked protests in cities and highlighted the nation’s persistent racial divide. Watch President Obama’s full speech at Tuesday’s interfaith service. He joined politicians, police officers and families of the fallen in the wake of the shocking slaying by a black man who said he wanted revenge for the killings of blacks by police. Rawlings spoke steps from five empty chairs and five portraits of the dead officers. A call for national and solidarity was reinforced by several speakers at the interfaith service, including former President George W. Bush, a Dallas resident, who attended with his wife, Laura. Bush called on Americans to reject the unity of grief and fear. “We want the unity of hope, affection and higher purpose,” he said. Former President George W. Bush spoke at the memorial service. Obama has denounced the shooting as a “vicious, calculated and despicable attack on law enforcement” by a “demented” individual. And he has argued that, despite the heated public outcry of the past week, the country is not as divided as it may seem. Obama’s choice of traveling companions underscored the theme. Republican Sen. Ted Cruz of Texas and House Democratic Leader Nancy Pelosi of California joined Obama him on Air Force One for the flight to Dallas. Republican Sen. John Cornyn, attended and spoke at the service but did not travel with the president. He described the attack as deeply personal. “Being a Texan doesn’t describe where you’re from it, describe who your family is,” the senator said. The White House said president worked late into the night writing his speech and consulting scripture for inspiration. Dallas Police Chief David Brown remembers the lives lost. As Obama landed in Dallas, spokesman Josh Earnest said the president had telephone the families of Alton Sterling, the man shot by police in Baton Rouge, and Philando Castile, the Minnesota motorist shot by an officer, to offer his and the first lady’s condolences. The president, joined by his wife, Michelle, and Vice President Joe Biden and his wife, Jill, were also meeting privately in Dallas with families of the slain officers. At least nine other officers and two civilians were injured in the attack.